CSA 101 – What is it? The Ox Share is designed for a larger family, or 2 adult vegetarians, and will fill approximately 2 plastic-grocery-sized bags each week with 9-12 different items per week in peak of season. Calf Share is designed for a smaller family, or folks who are looking for side-dish portions or eat out often and will fill approximately 1 plastic-grocery-sized bag each week with 8-10 different items each week in peak of season. NEW OPTION for folks looking for a smaller volume of produce and lower price-point, we are offering a limited number of Bi-weekly Calf shares. After you sign up for the Bi-weekly Calf Share, you will be assigned to the nine Even weeks or Odd weeks of the 18-week long season. You will be notified by email in early June which you will attend. So from late-June to Mid-October, every other week, you will come to pick up your Calf Share. Boxed Shares and Mini Boxed Shares are available for select workplace deliveries. You will get a selection of the freshest items being harvested that particular week. (See The Food Tab at top of page) The produce will change as the harvest season changes. Shares grow with the season: Early summer pickups begin with greens, radishes, kale, lettuce, collards and more. The share builds as the season progresses. Towards later in June, summer squashes, salad turnips, beans, broccoli, and cucumbers will populate your share and later in the season tomatoes, melons, peppers, potatoes, and winter squash. This natural progression of share contents allows you to enjoy the best of the season that is available here in North Central Connecticut. Each week there will be several items "automatically" included in your share, which you will select from a Farmers' Market style display. For the peak of the season this is usually 7-8 different products for either size share. We also offer additional choices within the "automatic" selection, so that you can get your share even more customized. Additionally, you will have a choice of several other items (often 3 for Ox size, 2 for Calf size) so that you may continue to customize your share to your tastes. Boxed shares are carefully pre-packed with a either a Calf-sized Full Box share, or about four items for a Mini Share and most weeks there will be additional items to choose from, alongside the boxes. A limited amount of extra produce is sent with boxes to allow for swapping. If there are certain items in your share of which you would rather have more or less, you can also swap them out with other members. This allows you to personalize your share, while allowing us to provide a wide variety of produce to all of our members at the best value for a Certified Organic CSA in the area. All customers are welcome to pick their own herbs, cherry & grape tomatoes and a few other items at the farm during any pick-up time. 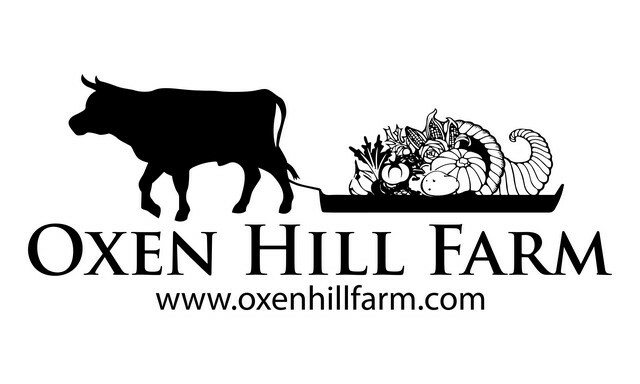 Members of Oxen Hill Farm Family are always available to answer questions about how to store and cook each kind of vegetable and we provide weekly recipe sheets with farm news about upcoming events, including kids activities and cooking demonstrations, as well as future harvests. 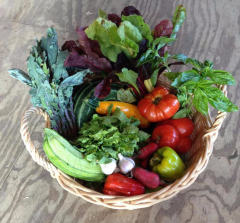 Why should you choose Oxen Hill Farm CSA? Organic: Oxen Hill is one of a very few USDA Certified Organic vegetable farms in North Central Connecticut. Organic production is one of the attributes that most of our customers greatly appreciate, limiting the exposure for pesticides and other synthetic chemicals. With Organic production comes some trade-offs. Some crops may show small signs of insect damage or may not have as long of a shelf life as those that have been treated with persistent insecticides and fungicides. We believe that the overall value of organic practices, which also encompass taking care of the natural landscape where we grow, far outweighs those risks. We Care About Our Community: We have been farming on much of our land for 11 generations, and our connections to the community run deep. We are regular contributors to the local food pantries (Foodshare in Bloomfield, Crossroads in Suffield, Emergency Aid in Suffield, Friend-to-Friend in East Granby, Loaves and Fishes in Enfield) and sponsor various community organizations including Suffield Little League as well as Girl and Boy Scouting activities. We Grow it All: At Oxen Hill Farm you can be assured that everything you receive in your share was grown and cultivated by your farmers. While we can't speak to what other specific farms may do, many 'farm membership plans' simply buy produce at the wholesale markets (grown however and wherever) and then redistribute to members. For customers that simply want a 'grocery store' style program, that can make sense. For most of our customers, they like to see the fields where the produce is coming from, enjoy the freshest produce in season, and talk to us about how things are growing.